1. Preheat the oven to 190°C, gas mark 5. Grease a baking sheet with a little oil. 2. Put the sugar for the praline into a small pan and add 4 tbsp water. Heat gently, tilting the pan every so often to ensure it gets an even heat. Once the sugar is dissolved, boil hard until the colour goes from pale gold to caramel. Don’t let it burn. When the mixture looks and smells caramelised, pull the pan off the heat, add the nuts and 1 tbsp lemon juice and pour immediately onto the greased baking sheet. Let the caramel get cold then break it up (bash it in a plastic bag with a rolling pin, or pulse it in a food processor). You want to end up with a mixture of little chunks and larger shards. 3. Halve the figs and pour 200ml of the Marsala into a large gratin dish (that will hold the figs in a single layer without leaving much room around them). Sprinkle on 3 tbsp of the sugar. Pack the figs, cut-side up, in the dish. Pour over the remaining Marsala and sprinkle with the rest of the sugar. Roast for 15-20 minutes, or until the figs are soft but not totally collapsed. The juices around the figs should be spoonable. If it’s very thick, add extra Marsala. You can serve the fruit warm or at room temperature). 4. Just before serving, whip the cream, adding the icing sugar, vanilla and remaining lemon juice, and stir in the praline. 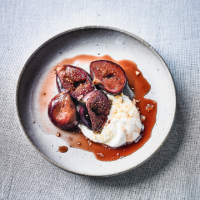 Serve the figs with their cooking juices and the cream.